In fact the next destination had been chosen during a search undertaken in concert with the Hubble Space Telescope team back in 2014. 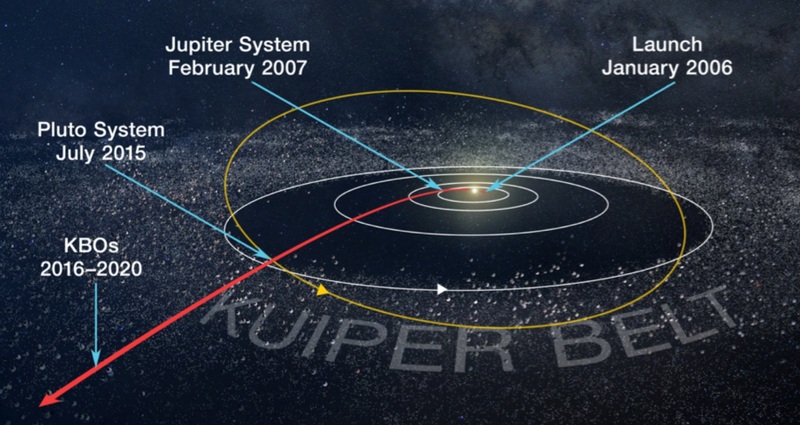 Ground-based reconnaissance wasn’t exact enough, and the New Horizons had to convince Hubble’s operators basically to dedicate two weeks of the satellite’s time on short notice to their cause. After an initial rejection and “some high-stakes backroom maneuvering,” as Principal Investigator Alan Stern describes it in his book about the mission, the team made it happen and Hubble data identified several potential targets. In the time I’ve taken to write this post, New Horizons has gone from almost exactly 600,000 kilometers away from Ultima Thule to under 538,000 (and by this you shall know my velocity) — so it’ll be there quite soon. Just about 10 hours out, making it very early morning Eastern time on New Year’s Day. Once those images start flowing in, though, they may be even better in a way than those we got of Pluto. If all goes well they’ll be capturing photos at a resolution of 35 meters per pixel, more than twice as good as the 70-80 m/px we got of Pluto. Note that these will only come later, after some basic shots confirming the flyby went as planned and allowing the team to better sort through the raw data coming in.